Our calibrated boards have had a fast pre-plane to bring the timber to a regular size which allows an extra 4mm in thickness for extra planing and straightening. 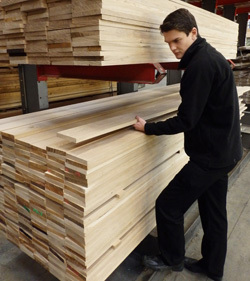 The timber is kiln dried to an average 9-11% moisture content. Board widths are typically between 190mm – 210mm, depending on stock availability. Board lengths are random but are typically between 1.8m – 2.4m. Our calibrated timber is available in three grades as shown below. For more information about the grading of oak or to discuss your own particular timber project please contact us, we are always happy to offer help and advice. Customers are also welcome to call in to select their own calibrated boards or, alternatively, orders can be taken over the phone.